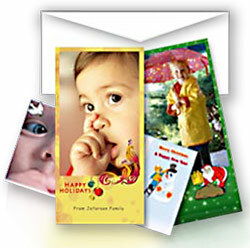 Add your personal touch on one of our Holiday Card Designs. If you do not have your own design you can now use for FREE one of the Art-Tec Prints holiday card designs. They are unique and we encourage you to add your own photo and a personalized message Send your wishes to your friends, relatives, clients and prospects on photo greeting cards. Send photo greeting cards, photo announcements or just about any other type of well-wishing, say-hello type of card you can think of. Add your personal message, photo cards are perfect for any occasion.